ACURAFLEX CAPSULES contain an effective formula of natural ingredients which for centuries have been known by their strong anti-inflammatory properties. Their positive effects on bones, joints, cartilage, muscles, tendons, ligaments, various inflammations and pain have been proven in numerous scientific studies. The natural formula of Acuraflex performs a wide range of positive actions on all organs and parts of the body. It is a unique, powerful, natural, non-invasive and safe treatment for preventing and slowing down conditions such as arthritis, sciatica, osteoporosis and other health issues such as inflammation, acute and chronic pain associated with bones, joints, cartilage, muscle, ligament, and tendon. ACURAFLEX CREAM contains an effective formula of natural ingredients known for centuries by its fast and powerful way of dealing with acute and chronic pain caused by inflammations, injuries and degenerative conditions such as arthritis, osteoporosis, and sciatica. 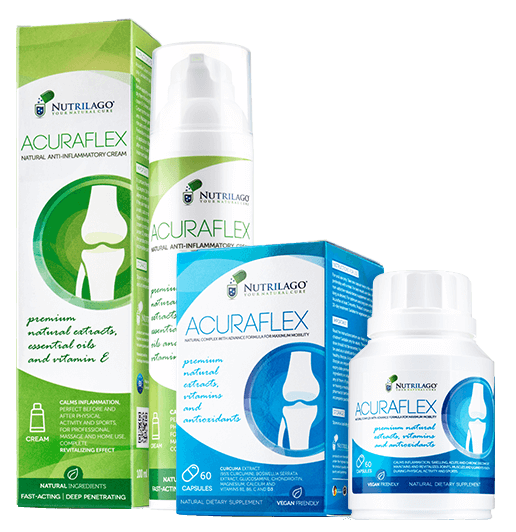 The effectiveness of the ingredients of Acuraflex cream on bones, joints, muscles, tendons, ligaments, cartilage, various inflammations and pain has been proven through numerous long-term scientific studies, conducted all around the world. Aside from acting on a specifically painful and sore spot, the Acuraflex natural formula has a wide range of effects on all organs and parts of your body. IT’S RECOMMENDED to use both of our products simultaneously in order to achieve optimal results. Capsules act on symptoms long-term and within the body, while the cream quickly and directly treats painful and sore areas from the outside. The ingredients of Acuraflex creams and capsules are exclusively natural in its origin, and apart from herbal extracts, they also contain vitamins, minerals, antioxidants, and essential oils. They don’t cause any side effects, and the cream also nourishes the skin and has a pleasant fragrance.